As the last trimester comes to an end and the whisper of a baby’s arrival turns into reality, expectant parents turn into ‘real parents’. Then starts the grappling with the HUMONGOUS changes that the new baby brings with it. The new emotions, the new routines and the responsibility of caring for a newborn that you brought into the world. As we said, humongous! 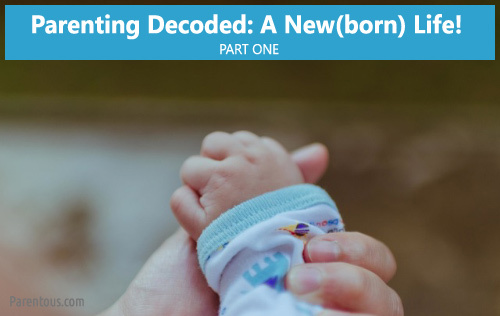 After our guide to having a happy pregnancy, we bring to you ‘Parenting Decoded: A New(Born) Life’. New parents and parents-to-be, read to get some help from experienced parents. Experienced parents, read on to relive your memories. You know why babies get away with so much? Because they’re tiny and cute, that’s why! Taking care of a newborn baby is no cakewalk, but who can resist taking care of that cuddly, pink bundle? This is exactly what Nischala feels, as she lists down all the things she loves about newborn babies. What? Survival guide? You’re not venturing into the Amazon forest with no tools, right? Well, you’re not, but the scale of the adventure you face is pretty much the same. Let Aditi Mathur give you some things to remember as you deal with the newborn. Think of them the next time you feel you’re not up for the task. For the first few weeks of their life, babies just feed, cry and sleep. The issue arises when the baby refuses to do what it’s supposed to do, i.e., sleep for most of the day. If your baby has erratic sleeping patterns that are tiring you out, you might want to read this article by Dr. Chander Asrani about kids and their sleeping patterns. As we said, babies are champion sleepers and criers. While there is nothing better than a sleeping or playing baby, one wail from the baby is enough to send the whole household running. More so when you don’t know why it’s crying! Before you lose your head, remember these simple things about a crying baby and how to soothe it. They will help you in times when you feel like giving up and joining your baby in crying. New parents have so much going on in their lives, that they don’t have time to think or plan ahead. This can make them miss a lot of things and developments in the baby’s life, which causes guilt and regret later. Here’s a letter from an experienced parent Reema to newbie ones, which will reassure and guide you. Babies gurgle and smile, but what if they could talk? We hope you’ve written the open letter to parents in the above link, so now we let baby add his/her two bits. Here’s a letter from a newborn to his parents (imagined, not literally of course), a letter which will warm your hearts. A new arrival at home heralds the arrival of many visitors who come to gush over the bundle of joy. No visitor likes to come ‘khaali haath’ to see a new baby, but are the gifts that they bring truly of any value? Here are some thoughtful gifts that you can give a mom, courtesy Anne John, which will help both mom and baby. Since ages, we’ve always seen Indian babies being carried around in their parents’ arms, and the trend of ‘wearing a baby’ is quite new. Carting around a pram in our crowded cities seems like an impossibility. Carrying a child has its own benefits. Check them out! Humour is the best way to deal with any situation. If you can laugh through the first few months of caring for your baby, then you have found a way to deal with the newborn life. Either that, or lack of sleep has caused you to go delirious. How do you recognize a new mom? Aditi gives you a few signs. Love your weekly salon appointments? Used to reading a book every night before sleeping? Too bad you have to say goodbye to that life once the little one arrives. We’re not saying that, Reema is. Read her blog post to know more. Don’t go into panic mode though. Like everything else, this is also a passing phase. These blog posts are what your life will look like when you get promoted from a couple to Mom and Dad. It’s the biggest, baddest roller coaster that you’ll ever be on, and Part Two of this crazy ride is coming soon. Till then, enjoy these blog posts and tell us your thoughts on parenting in the comments section below!